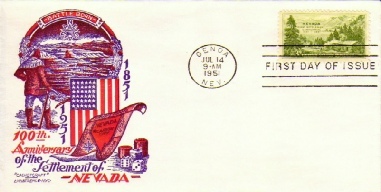 Meetings: The stamp club meets on the 2nd and 4th Saturday of the month, except Dec. The meetings start at 10 a.m., but the doors open at 9 a.m. for those who want to trade, sell, gossip, etc. Coffee and refreshments are available. Map to the meeting location, Silverada Estates Clubhouse, 2301 Oddie Blvd, Reno. April 27, 2019 - This is a Consignment Day meeting where members can put up to 10 items on the consignment table using the NSSS Auction Sheet with the sale price. After announcements and the raffle, there will be a philatelic presentation. Steve Foster will discuss Stamps of Burma. May 11, 2019 - This is a Auction Day meeting where members can put up to 5 items on the auction table using the NSSS Auction Sheet with the Minimum Bid price. Preceding the auction will be announcements and a raffle. May 25, 2019 - This is a Consignment Day meeting where members can put up to 10 items on the consignment table using the NSSS Auction Sheet with the sale price. After announcements and the raffle, there will be a philatelic presentation. Covers from past shows here. Prices are 50 cents per cover. 2015 show covers with a 40th Anniversary cancel. 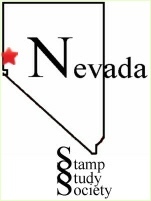 Thanks for visiting the Nevada Stamp Study Society.